This months Apple Pie Project goes to my home country, England. Although the apple pie is seen as an American symbol, in England it is an historic dish which has been eaten for centuries. 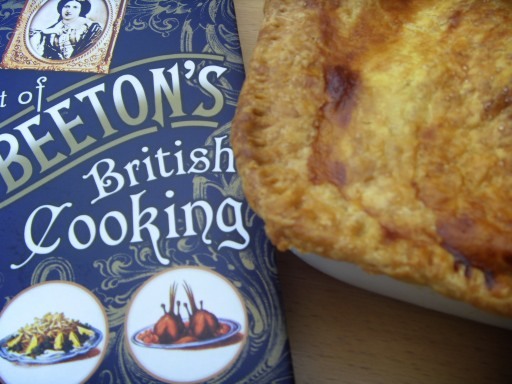 The British apple pie also has many differences to it’s American counterpart. 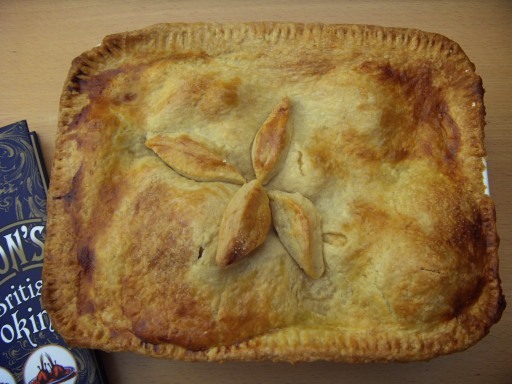 Instead of a super sweet filing, the English pie is more tart and sour with a hint of sweetness, using good old large cooking apples, such as the Bramley. This apple is a vibrant green, the size of a fist (or larger), sour and juicy. Once the Bramley apple has been cooked its keeps a more stable form, rather than turning mushy, being hailed the apple ‘King of Covent Garden’. What a rainy day it is in Cambridge today, so a perfect time to bake some nice thick gingerbread. The smell is amazing. This gingerbread is a traditional recipe which uses Black Treacle, so it’s not for the faint hearted, but don’t despiar if you want a lighter taste use golden syrup instead. Put sieve the flour into a basin, with the sugar, ginger and cinnamon, mix together. Then warm the butter and add it to the centre of the mixture followed by the treacle. Beat this dark sticky mixture together, trapping air. Now add the warm evaporated milk, with the the bicarbonate of soda dissolved In and vigourously beat into a smooth cake batter with the whisked eggs. Pour the mixture into a cake tin. Then bake for 1h20mins or until risen and crusty brown on top. When you take out of the oven leave in the tin for 15mins and then transfer to cooling tray. Yummy you can then slice and eat with a little butter or custard with a nice cup of tea! Today is Sunday and the best thing about this day is Sunday dinner, yummy slow cooked beef joints, sage stuffing, assorted roasted vegetables, thick gravy, plump suet dumplings and my all time favourite Yorkshire Puddings. Today I want to share with you my recipe to making, what I think, the perfect Sunday treat. I remember my great grandma making these for us and how she liberally seasoned with black pepper. For this recipe I don’t work in measurements just by eye but I will give you some idea of the weights as I go. Ok firstly take 3 eggs and crack into a mixing bowl, whisking the eggs lightly together to form an orange mixture, (I found in many recipes they recommend using 2 eggs, however I find if you want a dramatic, crispy risen pud use 3). Now with the egg mixture add a drop of milk (50ml), a pinch of salt and a liberal grind of black pepper. Then sieve in around 100g of Plain Flour and whisk quickly, trapping air and forming a light froth on the top. Now keep adding flour and water in parts and whisking until you get a nice slightly thick and heavy batter mixture. You want it the same consistency of a Shrove Tuesday Pancake, or slightly thicker. Now set the mixture aside in room temperature for around 2 hours. I find this helps the rising process and the secret to a good Yorkshire is how big they rise. When ready to bake, preheat the over to the highest temperature (around 300C) and in a Yorkshire Tin (If you don’t have one don’t worry use a cake sandwich tin instead) add enough oil to fill the bottom, around 0.5cm and heat until the oil is very hot and smoking (2-5mins) take out and spoon the Yorkshire batter in evenly and return to the oven for the next 10-15mins, or until nice and high, golden brown and crispy. There you have it the perfect Yorkshire Pudding, and if you have any left over eat for dessert cold with a spoon of jam in the centre.